Jainism is an ancient religion from India that teaches that the way to liberation and bliss is to live lives of harmlessness and renunciation. The origin of Jainism comes from the teachings of a man called Vardhamana Mahavira. He was born in Northern India in 599 BC in a culture where Hinduism was the main religion. He was not pleased with the teachings of Hinduism and became an Ascetic to spend life in meditation and contemplation. It was then that he developed his beliefs which he wrote in the Ahimsa, which became the basis of Jainism. Jainism is a religion of self-help. There are no gods or spiritual beings that will help human beings. The three guiding principles of Jainism, the 'three jewels', are right belief, right knowledge and right conduct. The main tenets, or Mahavratas, of Jainism are non violence, non-attachment to possessions, not lying, not stealing, and sexual restraint (with celibacy as the ideal). Jainism has no priests. Its professional religious people are monks and nuns, who lead strict and ascetic lives. 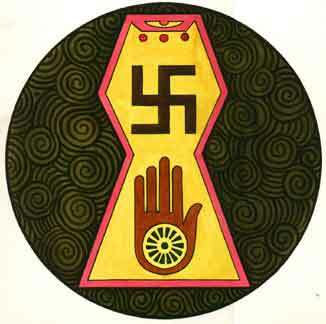 Jainism is concerned for the welfare of every being in the universe and for the health of the universe itself. Jains believe that animals and plants, as well as human beings, contain living souls, a jiva. Each of these souls has equal value and should be treated with respect and compassion. Jains are strict vegetarians and try to minimize their use of the world's resources. Jains believe in reincarnation and seek to acheive ultimate liberation - escaping the continuous cycle of birth, death and rebirth so that the immortal soul lives for ever in a state of bliss. This can only be done by eliminating all karma from your soul. Most Jains live in India, and according to the 2001 Census of India there are around 4.2 million living there. However, the figures may be lower than the true number of followers as many Jains identify themselves as Hindu.